Last September, President Donald Trump appeared on the Dr. Oz show and talked about his love for golf. He told host Dr. Mehmet Oz he wished he could play more often. The moderate-intensity activity is a hobby sport for over 55 million people worldwide! When compared to high-intensity sports like football, soccer, and hockey, golf may get a bad rap, but a study published in the British Journal of Sports Medicine shows that there are in fact physical and mental health benefits of golf. Dr. Andrew Murray, lead author of the study and sports medicine consultant at the University of Edinburgh, notes that golf can improve known risk factors for heart disease, including “physical inactivity, blood lipid and insulin-glucose levels, body composition, and aerobic fitness,” in the paper. Dr. Jordan D. Metl, sports medicine physician at the Hospital for Special Surgery in New York, recently told CNN the benefits of exercise activate after 30 minutes of walking a day. By the sounds of it, a long golf game is beneficial to your health—so play on! In addition to the walking aspect of golf, you also have greater exposure to vitamin D from the sun’s rays since you’re outside for a few hours. This vitamin is pivotal in bone and heart health and reduced risk of type 1 diabetes, multiple sclerosis, and many cancers. There are also reports that golf strengthens the bladder, burns calories, is good for your brain, improves vision, allows for better sleep, and is a low-risk injury sport. The benefits of golf go beyond physical health. Experts agree that being outdoors, getting vitamin D from the sun and fresh air from the trees and grass around the course, and the peacefulness of being in nature can reduce stress, and help alleviate anxiety. 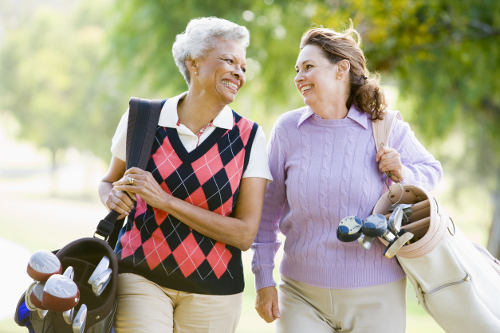 Golf is also a social sport, so older adults who have golf teams or play with friends and family can interact, meet new people, and connect in a community. This combats the risk of depression and loneliness often experienced by retired and older adults. If you haven’t started playing golf as yet, perhaps you should now! Even moderate physical activity can benefit your health, so if you’re a golf lover, keep playing. The physical, mental, social, and emotional benefits of golf seem undeniable. And, since the sport is moderate-intensity, it is the perfect sport for older adults. However, if you have any medical conditions, such as arthritis or heart conditions, I advise speaking with your physician before you take up golf. Frayha, A., “Is Golf Exercise?,” CNN, April 10, 2017; http://www.cnn.com/2016/12/02/health/golf-exercise/index.html, last accessed April 12, 2017. Aubrey, A., “Take a Swing at This: Golf Is Exercise, Cart or No Cart,” NPR, June 15, 2015; http://www.npr.org/sections/health-shots/2015/06/15/413683367/take-a-swing-at-this-golf-is-exercise-cart-or-no-cart, last accessed April 12, 2017. “Top 10 Health Benefits of Golf,” Health Fitness Revolution, May 14, 2015; http://www.healthfitnessrevolution.com/top-10-health-benefits-golf/, last accessed April 12, 2017. Murray A., et al., “The relationships between golf and health: a scoping review,” British Journal of Sports Medicine. 2017;51(1):12-19. doi:10.1136/bjsports-2016-096625. “Vitamin D: Vital Role in Your Health,” WebMD, http://www.webmd.com/food-recipes/features/vitamin-d-vital-role-in-your-health; last accessed April 18, 2017.